Yesterday morning, the Board of Selectman approved several changes recommended by Parks and Recreation. Fee increases will pay for $200,000 worth of maintenance, supervision and a full-time police officer. The new charges — and increased personnel — may ease some of the overcrowding and complaints that arose last summer. Beach stickers will now cost $50 for residents — up from $40 last year. The senior and handicapped fee goes from $20 to $25. The non-resident price rises from $490 to $775. Weston residents — who occupy a middle ground between Westporters and non-residents — will now pay $375 (up from $25o). Weston seniors’ stickers are now $200, a $65 increase. Daily parking increases too: It’s up from $40 to $50 weekdays, and from $50 to $65 on weekends. Only 100 daily passes will be sold this summer — and purchasers will have a special parking area. In addition, this year 350 beach stickers will be sold to non-residents. Last year’s cap was 600. 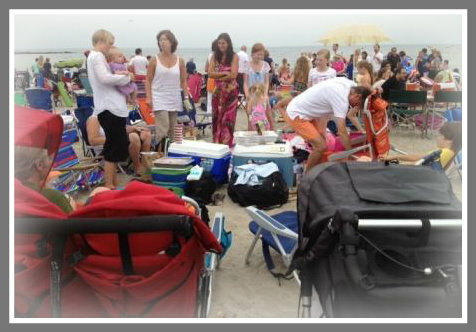 Fee changes may ease some of the crowding at Compo Beach. This entry was posted in Beach, Local politics and tagged Westport board of selectmen, Westport Parks and Recreation. Bookmark the permalink. Thank you!! Much needed to changes. Yay! I think all of the changes and price increases seem fair except I’m curious as to why Weston residents were charged so much more while day passes for out of towners rose so little. Seems strange. I’d raise the out-of-town guest passes the MOST! If I were a Weston resident that only used the beach sometimes, I wouldn’t but a pass at that price. Cheaper to just Uber to/from the beach if you’re only going to use it a bunch of times. What Dan didn’t state was the out of town emblems also have a near 60% increase as well as being limited to 350 passes. The number of passes allowed to Weston residents was not limited and they still get a lower fee than out oft owners not from Weston. There will be increased police enforcement this summer. Charlie. Thank you for doing what was needed to help take care of our beach. At under a $1 a day it is more than fair. Our neighbors and friends in Weston would spend more on gasoline to do their shopping and eating in Fairfield if they so desire. Not all Weston residents can afford an increase of $1 a day, as you say. I’ve been going to Compo beach since I was a little girl. I had my college graduation party at the marina. I have so many fond memories and love for this beach. It upsets me that I can’t afford to share these memories with my 1 year old son. I’m not going to spend more money to go shopping in Fairfield because although this decision upsets me, I still love Westport as much as I love Weston. This was a bad decision, and I truly hope you will see that this summer. People will just continue to (and have more incentive to) Uber. I think an unintended consequence of this change will be an increase in illegal parking on the surrounding neighborhood streets in the Compo Beach area, which are all “no parking” areas for safety and other reasons. The illegal parking fine is $75 which is now only $10 more than a weekend daily pass, and that is if you even get a ticket. Enforcement has traditionally been very minimal, so if someone’s choice is paying $65 or taking a 50/50 (or more) chance of paying nothing, I think a lot of people will risk it. The police need to step up their enforcement of scofflaw parking in the area and consider raising the illegal parking fine to something more significant like $150 or $200. Last summer with the extra crowds people were seen openly parking illegally and willing to pay the parking ticket fine (if they even got a ticket) for their day at the beach. Matt-you bring up a great point and the issue regarding the parking fine. Westport. Reds to change the cost of the fine and not all the arbitrage between the parking fee and the parking fine. There will also be a police monitoring the beach. Insofar as the Uber drop offs that will be handled as well. There will be signs posted and a harsher “foot to flame” for drop offs. If I were not a resident I would be more than grateful for Sherwood Island. Weston? Should have been annexed by Westport years ago because its not a viable community if you take Westport out of the equation.. Nothing like bigger snobs trying to piggyback off of lesser snobs. Agree, Weston is simply out of town and should not got any benefit not offered to other out-of-towners. Eric, shame on you. I invite you to come spend time in our community, we have several attractions you might enjoy and our door is always open. Kelly, thanks for the invite – what time do you serve dinner and can I stay overnight 😉 I lived in Weston for seven years, went to school with many Weston friends (before they decided to build their own HS and stop paying to use Staples – hmmh, is there a lesson there?) Also, worked in the Weston hardware store right out of college while looking for a career. I love Weston but there was a time when Westonites enjoyed their town enough not to mind paying to get into Compo which they didn’t use frequently anyway. I’m sorry some have chosen to interpret my remarks as verbal violence directed toward them but the choice has always been to either live in Westport or Weston – and be thankful you could afford a choice. Also, I fail to see how suggesting that Westport merge with Weston is so hateful toward Weston. I think both communities would gain and it would eliminate the beach fee atrocity. Anyhow, my dogs are no longer in this fight but as long as Dan offers a venue for my thoughts I’ll probably keep expressing them. After all, sticks and stones yadayadayada. And the clogged entrance exit? When is it going to be only one way in by the boats and one way out at the usual exit? Dropoffs are not allowed? How can that be legal? Westport residents will get a seasonal increase of 25%. Weston residents will get a seasonal increase of 50% with no limit of passes. Non-residents will get a seasonal increase of 58% and passes will be limited. Daily parking will increase 25% and 30% and will be limited to 100 spots. It isn’t accurate to compare seasonal increases with daily increases, as it depends on how often one goes to the beach. Weston residents generated $200,000 in revenue for Compo last year and were good stewards and neighbors. As season pass holders we had just as much invested in keeping the beach clean for ourselves and our children as Westporters. Given how unwelcome we now feel many of us will now be frequenting other spots, not just with our beach dollars but our shopping dollars as well. I’ve already cancelled restaurant reservations for this weekend. Agreed Sarah. This makes it really easy not to buy a pass at all, and I just switched my lunch reservation to a place in Fairfield. Hope they find that $200,000 elsewhere. Shannon-you really cannot pay less than a $1 a day for the new parking fee but are willing to spend more on gas to go to Fairfield? Really? How does $375/season equate to less than $1/day? I can’t speak for Shannon, but the message I’m getting from Westport is that the town is not welcoming Weston residents. Why would I spend my money somewhere I’m not wanted? Movies with an inexpensive dinner. Weston is loved and wanted-I am sure. The fact that’s weston is being asked to pay a bit more for a beach pass has nothing to say about our friends and neighbors in Weston. Again, I can tell where I’m not wanted. And for the record, I haven’t spent a penny in a Starbucks in my entire life. That comment was written by one person who hasn’t lived in Westport for 40 plus years. I don’t see a chorus of Westporters repudiating it. You should be pleased that ex-pats still care. The comment wasn’t helpful or caring nor is yours. I believe Eric is simply trying to have some fun with this long, sad story. Nancy, its not that ex-pats don’t care, its that they don’t care enough. It’s not more in gas- it’s about the same. The pro and the con of living in Weston is everything is 15 minutes away (except our beloved town center). It is just as easy to shoot up to Fairfield or over to Wilton for food and shopping. I haven’t been to the Fairfield beaches, but I hear they’re lovely and have more reasonable parking rates. All that aside, the increase in Weston’s sticker price is insulting and doesn’t reflect that value that Weston residents add to the Westport economy as a whole. Last I checked, none of the taxes Weston residents pay go towards maintaining the beaches in town. Nor do they go to maintain any of the other facilities you use. You park at out train stations which make the waiting list to get a spot even longer, enjoy our beaches, speed through the streets in our town, your kids play sports on our fields, you play golf and tennis at Longshore, you use our outstanding Library, you attend concerts at the Levitt, and you walk your dogs at Winslow Park. I and everyone else in Westport pay for you to enjoy all of this. So, forgive us if we think you should pay more than I should to get a parking spot and enjoy the beach. I moved from Weston to Westport years ago because Weston didn’t offer me all of these things and yet my taxes were higher there than in Westport. I suggest you do the same if you want to feel like you aren’t being treated any differently. Further, why should Weston residents pay anything different than people who live in Norwalk or Fairfield, who undoubtedly, simply because of the size of their towns, spend more $ in our stores and restaurants than you do. If you want to dine there instead of in Westport, that will make getting a reservation tomorrow night much easier for me. A few thoughts, everyone pays for railroad parking passes no matter where one pays taxes. Weston has its own fields and kids there play on them; if Weston plays golf or tennis at Longshore, they pay higher rates, and they have their own library. As far as dog walking, how many Westporters use Devil’s Den or Troutbrook? I don’t know that Fairfield and Norwalk spend more or less in Westport as they both have sizable retail/dining opportunities in their respective towns. Can’t believe the anger and hate I am seeing in these posts. Lynn, with all due respect, I’m not sure you understand the economics here. Do you really think the amount of money Weston residents collectively pay to park at the Westport stations covers anything near the cost of maintaining and monitoring the facilities? I am pretty sure it does not yet the number of Weston residents who have parking permits is fairly high (which makes it harder for Westport residents to get parking permits). The same is true for Longshore – do you really believe the greens fees Weston residents pay cover any significant part of the maintenance? Have you seen the size and resources at the Weston Library vs the Westport Library? Of course, Weston residents are using ours. And all of this is paid my me and my neighbors. And, for the record, Sarah Grigerick started this by saying how unwelcome we were making her feel and that she is going to stop shopping and eating in town. That’s fine with me – more parking spots for me, less traffic in town, and easier to get dinner reservations. All of this has to be paid for somehow and since Westport residents pay the bulk of it, we have the right to decide how the facilities should be used and by whom. No hate here – just a dose of reality. No more from me on this topic. “Q: I’m a Westport resident. Why are out-of-town residents allowed to park at the Westport stations? At this point we feel that stricter enforcement of existing regulations will suffice. The department believes that no additional restrictions on tents is needed if enforcement is improved. Bob, This is about parking congestion and overcrowding, not about people. We are not not charging people, we are charging cars. There is still free access for people. So it’s not about people, it’s about overcrowding? I hope you are as concerned about real social inequity in this country as you are about cheap beach parking. There are, of course, other options besides Compo Beach. Sherwood Park State Beach might actually be free starting this year. I know that CT state parks will no longer be charging for parking. Don’t know about any other fees. Fairfield has 2 beaches (Jennings and I forget the other). Nonresidents can get a season pass for $175. Norwalk has Calf Pasture Beach and I think the nonresident season pass is $225 or something like that. Thanks India. Westonites are aware that we have other options. We will also be spending our shopping and entertainment dollars in those towns you mention – Fairfield, Norwalk and Wilton. They seem much more welcoming to your sisters. I’m not good with threats. It doesn’t matter to me where you shop. I trust you’ll shop where you feel most comfortable. I was just trying to be helpful by pointing out that if the fees at Compo have become too steep, there are other more affordable options. I’m sorry some of you are angry. I wish you all the best. We live in Fairfield, and have preferred Sasco Beach since moving here 16 years ago. It’s quiet, secluded and has no concession stands, unlike Jennings and Penfield. However, apparently the secret has gotten out, and it’s become very over-crowded. Last Summer, we couldn’t stay because the very limited number of parking spaces were all taken. I think you need a separate pass for Lake Mohegan. There’s a difference. It could be about people, sure. But if you have to wait in line to get into the beach, it’s hard to fine a parking spot and there is congestion with tents for instance, one could fee that the beach is overcrowded. How about the Town of Weston allocate a portion of their property taxes they collect to pay the Town of Westport to maintain the beaches, and all of the associated costs? In turn Weston residents could enjoy the beaches at a reduced rate. because the beaches are PUBLIC! Too bad 06880 is public or more importantly Dan decides it should be public. So, now your calling on Dan to close comments to non-Westporters? Erin-NOT AT ALL. Just one person and many know who, that I wish would be shut off. However, Dan is a true person and would neve do that. Bart, you should have submitted a White Privilege essay last year. You do realize you are counting on the revenue from Weston residents buying season passes at exorbitant rates in order to make all the imporovements you’ve promised? Now that you’ve increased and capped non-resident passes (which had already passed the amount people were willing to pay) and only raised other fees nominally, the assumption here is that you will continue to get 1200 Weston subscribers at 375 a pop. Otherwise the math just doesn’t work. Go ahead, get out a calculator and run the numbers yourself. Being rude to us isn’t helping. But we are already more than happy to frequent other beaches. If you sell 1/4 of the Weston beach passes you did last year I’d be shocked. And you may not want us there, but you are counting on the revenue we bring in to make this proposal work. Just doesn’t seem like we’ll thought out plan. As I’ve mentioned earlier, I no longer live in Westport and never lived in Weston. However, as a disinterested party, it appears to me that the higher fees for Weston residents are used for maintenance of the beach, which they apparently enjoy. Westport property owners pay for this through their property taxes. Do Westport property taxes pay for the beach? My understanding is that beach fees more than cover lifeguards, parking attendance, and maintenance. Westport property taxes do not pay for Compo. Are they looking to raise $200,000 on top of another line item in the budget because these don’t seem like outrageous numbers to expect. I enjoy the beach and had an out-of-Weston pass on my car last year. Not sure if I’m going to do it this year but that’s more because my kids are getting older than because of the price. Yes, they are looking for an additional $200K on top of the ~1.5M in revenue the beach brought in last year. Given that $1M of that comes from out of town users, just a small drop would mean they won’t meet even last year’s numbers – never mind the additional $200K they are looking to raise. Would someone please explain how raising fees for seniors and the handicapped is a good thing? Has anyone heard of the expression “pay it forward”? Maybe park your car at Sherwood Island and walk to Compo while stopping to rest at Burying Hill if you need to. Anything below the high water mark is public. You can enjoy a walking tour of the beautiful Westport homes you’ll pass along the way and the owners can do nothing while you’re striking a blow for social justice. Then go home after a wonderful day, kick back in the pastoral beauty of 2 acre zoning. Think of the memories you’ll make. Eric, you’ve been away too long. Compo is in the opposite direction of Sherwood Island from Burying Hill. Thanks Dan. I’m in Darien now still trying to find Burying Hill. Nice walk though. As a weston resident every year I bought two passes. Even at $250’each I could justify it. But with a 50 % increase I will not buy any. You can enjoy your out of towners and noise/loud radios and lack of parking. Compo is a dirty beach always has been. For 45 years I have spent my summers there. I overlooked the rocks and dirt. No more. Thanks Westport. OMG…..all this hate and commotion over beach passes?? Like anything in life…pay the price to enjoy the goods or don’t. Compo Beach is in Westport…..Westport makes the rules…..lots of other beaches you can frequent with a smile and at peace. No particular “Town” is being targeted. I have a summer house in Fairfield on the beach, however, last summer I couldn’t get to my boat slip that I pay $1,000 per year plus beach passes and Westport taxes. It wasn’t fair or acceptable…..but I did stay calm. Enjoy! People in Weston are nonresidents of Westport and are no different from someone in Norwalk or Wilton, why should they get any benefit of a reduced price compared to out of towners? The argument that they shop in Westport can be made by any other town, it’s not Westport’s fault that Weston has a lack of shopping, or a lack of a beach. New Canaan doesn’t have access to Darien’s beaches. Wow, can’t believe the hostility I am seeing here. I never realized the anger and resentment felt by Westport towards Weston. Very sad to read and learn about this. As many have said, people will choose to go where they are welcome. Sadly, Westport doesn’t seem to be one of those communities. Lynn that is not a fair comment. A lot of this started by people from Weston posting how they did not like the price increase and in turn would turn their backs on westport and shop and dine elsewhere. That seemed a bit over the top for a price increase that amounted to less than a $1 a day. Almost every town in CT is adjusting to the “new CT” where the state budget is in crisis and towns have lost payments from the state for education and PILOT payments. Not sure about the Weston situation but Westport lost millions. It will cost more for people living throughout CT as the budget crisis will only get worse. Every town will have to make adjustments. I hope those in weston that posted their exit of Westport, their threat to shop and dine elsewhere, does not happen. We are neighbors and we all have to understand this is a new “CT”. People in Weston are in the same situation (we are in CT too) and part of the issue is we find it unneighborly Westport is trying to maintain its property for the near exclusive use of its residents on our backs. I will note again that not one dime of Westport taxpayer money goes toward the running of Compo – it’s always been a money maker for the town. Due,of course, to the exhorbinant our of town fees. Now that you’ve finally priced everyone else out you will have to open up that tax piggy bank. Again, doesn’t make sense to me, especially in today’s financial climate. It must just be that important to keep the surrounding towns out. True out of town era will just Uber in for free like they’ve always none. Nothing legally to be done about that. People in Weston are in the same situation (we are in CT too) and part of the issue is we find it unneighborly Westport is trying to maintain its property for the near exclusive use of its residents on our backs. I will note again that not one dime of Westport taxpayer money goes toward the running of Compo – it’s always been self-sustaining plus for the town. Due,of course, to the exhorbinant our of town fees. Now that you’ve finally priced everyone else out you will have to open up that tax piggy bank. Again, doesn’t make sense to me, especially in today’s financial climate. It must just be that important to keep the surrounding towns out. True out of town era will just Uber in for free like they’ve always none. Nothing legally to be done about that. Just a guess that Westport beaches will be filled with our friends and neighbors from Weston this summer. And that Westport taxes and the additional parking fees will help lead to a fantastic and safe summer. What Westport taxes? Show me the data please. And you do understand that some people don’t actually have $400 lying around to spend on 6 trips to the beach that happen at night because they work during the day? But what this does do is divide the kids if the town into the have and have nots. Some can meet up with their Westport and Weston friends for play dates and some can’t. It’s elitist and gross and most importantly won’t solve the actual problem of overcrowding. And certainly won’t get you your $200K in improvements – not because people are angry but because they honestly can’t afford it. Hi Dan! I see what you’re saying but that puts a disproportionate burden on our “have” neighbors to provide free childcare, which is not something I or anyone else would ever ask of anyone. Lots of kids will just miss out. Thanks, Sarah – I’m not sure I get your point. You were talking about play dates at the beach, right? So why not just carpool there? And nothing is stopping any without a sticker from driving a few kids and parents down, dropping them off, and someone else picking them up. Most cars can’t fit that many people plus booster/car seats. Carpooling usually involves kids not kids plus parents – there just isn’t enough room in the cars to fit everyone. We have to bring along younger siblings on play dates – who would watch them? This system would require a bus. Sorry if this seems like a silly conversation, but you seem sincere so I want to give you a sincere answer. Q: How many Westonites can you fit in a car? A: Throw a beach sticker in. Q: Wouldn’t you like to live within ten miles of one of the nicest public beaches in New England? Your emblems still cost a lot less than emblems at Compo for other out of Towners. The number of emblems available to Westonites were not limited as were the dailies or out of town emblems. Westporters are covering roughly 1/2 the additional costs and out of towners 1/2. We understand that the increases are high in percentage terms. We hope you continue to use our fine facilities in Parks and rec, but it’s a free world. This overcrowding issue is one that affected all shoreline communities in SW Connecticut, not just Westport. I would be surprised if other affected communities take similar actions. Mr. Haberstroh, The number of Westonite passes were not limited because you all NEED Weston dollars to make your $200k increase in pass sales. The price and limit change for out-of-towners hardly adds any top line. I don’t have all the numbers, but from what I’ve seen, and with a few assumptions on % of seniors, Weston is expected to pay a grossly disproportionate amount. Just looking at Weston and Westport, if Weston pass sales remain the same (they won’t) you’ll have 7% of the people paying for 49% of your top line growth! I’ve also noticed, that if you lose roughly 20% of weston passes, you don’t get your $200k. Again, I didn’t have access to all the numbers. Since this is so atrocious, I assume I’m missing something? Also, since I believe you are in charge of parks and rec, perhaps you can explain how an analysis, with the goal of reducing overcrowding, was completed without beach usage data? I didn’t break even on my pass last year at $250. No way I’ll pay more. And for the record, I was never even there when it was crowded. Most families with young kids go early am or early evening, so losing me doesn’t help your overcrowding problem at all. Also, you all may want to take note that Westport NEEDS Weston residents to buy passes this year, if you want to make all your proposed upgrades. You can’t do it alone with Westport and out-of-towners. A $1/day increase would seem way more than reasonable if I lived the life of luxury I have always dreamed of: one that allows me to go to the beach every day. But in real life I only get to go to the beach to sit and relax with friends (or solo + a book) about 4 times per summer. So the increase isn’t realized as a daily cost, but as a 1 time hit in May that I try to justify or amortize on a per visit basis. $250 for 4 visits was a splurge, but we did it because it encouraged us to try and use it more than we did – in a good way. And we knew we were helping to pay for the coastline, which is also good. $375 for 4 visits becomes unsustainable and encourages us to find other ways to enjoy the coast, which we will. And we will probably also get back to riding our bikes to Compo from time to time to enjoy it at Westport’s expense. Or carpool with Westport friends. At least until you Build a Wall. And make Weston pay for it. The wall comment is nasty and why some of us in westport don’t find you friendly, appreciative or understanding. Again, as I said above, the message I’m getting from Westport is that the town is not welcoming Weston residents. Why would I spend my money somewhere I’m not wanted? Westport welcomes anyone (with money). The “wall” analogy has crossed my mind, too, sadly. I don’t recall this mindset from my years in Westport. I just don’t get it. This discussion seems so bizarre. Westport has announced the new price for passes. If you don’t want to pay for a pass, then don’t pay for a pass. My sons have told me that they want to make sure we can keep going to Compo and they don’t want to risk being blocked or by the limit on daily passes. So, we’ll be getting a pass. And eating at Joey’s and Shake Shack and, maybe, trying the new deli on Main Street if they let us. Will the new roof be be finished by Memorial Day weekend? It’s the underlying sentiment that Westport does not welcome others on the beaches. Bizarre, indeed. The history of this is documented here on 06880. We are quite welcome. We have to pay to bring a car. You don’t like the price? Don’t come. Let’s just call it congestion pricing. I suggest Westporters pay forward to seniors and handicapped beach-goers. I also suggest that Westporters accept the reality of “other’s” noise, smoke, umbrellas, etc. that irk. This has been fascinating to follow. Don’t go for the bait. No matter what you say, it simply fans the flame. There’s nothing to be gained by rational explanations and good intentions, much less unpleasantries. I live in Norwalk and sometimes frequent Compo Beach. I will drop my chair and cooler at the beach, park at the train station and bike my way back to the beach. Can’t stop me from biking in and I get a good workout before I plant myself on the beach. Honestly a 65.00 daily parking fee is crazy for any beach especially for one on the sound. No waves Rocky coast and a long walk into the water when the tides out. From a purely realistic standpoint, if the goal is to eliminate overcrowding, this is going to miss the mark. The die hard beach goers are going to pay the higher fee. What you are going to lose is the occasional beach goer or the people who visit the beach during off hours. I am Weston resident and I bought a beach sticker last year for the first time in 5 years. I had stopped buying them because for the 3 times a year we went it was cheaper to pay the day rate. Now I have a 2 year old and my nanny would take him to the beach for an hour or so some mornings and get lunch at Joeys. For $375 it’s not worth it. Not when I also own property in Norwalk and can go there for free. So rather than getting $250 from someone who barely used the facilities, you’ll get nothing. It’s like running seniors out of town. They feed the revenue without drawing on the resources. Westport would have been wiser to hold some fundraisers for beach improvements, where people would have happily given money without feeling like they were being ostracized. Westport would have been wiser to install parking meters, since meters don’t know where you are from. I’d be all for parking meters but only if we still had Paul Newman to cut the heads off them. — or, only if we still had Steve McQueen’s glove and baseball? Hilary, if your nanny asks for a raise because she can’t afford to work – would you fire him/her or suggest that she hold a fundraiser to subsidize your childcare? I’m guessing Hilary wouldn’t ask her next door neighbor to cover the cost of her nanny’s raise while at the same insulting her neighbor’s property, looks and general decomportment – and then asking her neighbor to please stay behind her property line or suggesting other houses she may enjoy visiting for coffee. If I shared a nanny with my neighbor forever and my nanny asked for a raise, I wouldn’t expect my neighbor to increase her pay by 50% while I increased her pay by 10% unless i knew my neighbor was using 40% more of her resources. Sharing implies joint ownership which could be accomplished by merging the towns other than that its called paying for services rendered. The irony here is, the over crowding is most likely from Westport beach goers since it is they who frequent the beach most often. Any Westonite will tell you they most often go during quiet times, off peak. And most (like me) had paid for the sticker, but rarely seem to get the full value of it since usage is lower than one ever anticipates. The disproportionate imposed increase in Weston stickers (seeking to subsidize needed improvements) will likely discourage many sticker purchases (from people who rarely use the beach), putting less in the pot to help with improvements. Unless there was a study done, measuring who exactly is overcrowding the beach, I would think that westport residents will wonder why, even after these new fees are in place, the beach is still crowded and they haven’t hit their funding goal. It seems to me that the fact is not recognized that nice folks from Weston put in a lot of money to use the beach infrequently, and are not part of the overcrowding problem, are on the hook for future funding. Please save the comments of, “well if you don’t like it, don’t come”. Those things are perpetuating a nasty, unnecessary tone. The larger irony is Westport ‘s rally cry against the Trump administration’s lack of liberal values, while Westport — touting its great support for liberal values — wants to keep people out of the town. No, Westonites want to keep price increases out of their bank accounts. You can’t blame them. Liberal values include offloading the cost to the other guy and then calling him ungrateful. “Thank you Sir, may I have another?”. I also question that you need these increases to raise revenue. Compo brought in ~1.5M from user fees last year. The budget to run the entire parks and pool system according to your own BOF documents was $579K. (Compo isn’t broken out). Seems like there is plenty of money to clean the bathrooms. This price hike is either a) about keeping people out b) using neighbors’ money to fund other Westport projects. If I’m wrong happy to listen to a response from the P&R people. With data. I hope increased fees aren’t the beginning and end of the solution to overcrowding. Has installing additional bathrooms/showers on the beach to keep people from concentrating in one central location been taken off the table? Is there a plan to change the entry/exit system from the beach, at least during peak hours? No left turn on exit and two lanes for entry would be HUGE! Like many towns in southwestern Connecticut, Weston is among the most affluent communities in the United States. Data collected in 2011 showed that Weston had the highest median household income in Fairfield County, Connecticut, at US$205,173. In 2011 Connecticut Magazine named Weston as the number one town in Connecticut among towns with populations of 10,000–15,000. The rating considers education, crime, economy, cost and leisure. Aside from a handful of stores that form the town’s center, Weston has little commercial development and residential development is limited by two-acre zoning. Most of Devil’s Den Preserve, a 1,746-acre (707 ha) nature reserve, which gets 40,000 visits a year, is located in the town. To show the evolution of the mill rate, the asterisked numbers are adjusted to account for the revaluation of 2013-2014. The revaluation decreased the real estate property values by 13.18 percent, not counting a 0.75 percent natural growth in real estate stock during the revaluation. Besides, the numbers for 2008–2009 and prior years are further adjusted for the 2008-2009 revaluation which added 2.92 percent to Weston’s grand list of properties. How many of the 40,000 visitors a year to Devil’s Den are from Westport? For which you are charged nothing, to either visit or park? And towards which our tax dollars actually go to maintain? Probably the same number as Westonites who come to Winslow Park with their dogs, for which ditto. Don’t worry, Dan. We are building our own dog park in weston, hopefully. AND all would be welcome! I would think that with two acre zoning that Fido would be happier relieving himself on the premises instead of holding it on the long jaunt to Winslow. I guess NIMBY is mainstream to all suburbs not just coastal ones like Westport. I don’t understand why this needs saying, but apparently it does. You don’t bring a dog to a park to poop. You bring him there to play with other dogs. Christina, I admittedly haven’t seen it 1st hand but I think Dan has documented a number of times in this blog that Winslow is the Canine Shangri-la of Fairfield County. In any case, I think most dogs would agree that playing with other dogs is the essence of self-fulfillmant but it just wouldn’t be the same without a good dump.followed by a communal sniffing of one anothers posterior. But it begs a question: Don’t you think its only fair that Westonites be allowed to bring Rover to Compo in return for theiir fee increase? Maybe a good compromise would be for Westonites alone to be allowed to bring their dogs to Compo as long as they can make it through the front gate in the same car. Most canines would consider it dogmatic. Pooch Lives Matter. My, Eric, this post has really ruff–led you… I still don’t know why a town demands to be paid for Public spaces. Are visitors really tearing the beaches and parks apart? Should all visitors, human or canine, show identification at the gates for a surly agent to pass or fail, or better yet be given DNA tests? I can NOT believe some of the comments here by Westport residence! I mean I am shocked !! What hatred and pure tacky behavior- (not totally uncommon in town) but I’m really shocked by the balls to write it down here. There are good people in Westport but there a lot of bad ones and they are shining bright and casting a very bad light on the town as a whole. I guess Trumpism IS everywhere! It seems to me that most of the nasty comments are made by Westonites. Just sayin’. It’s always a shame when people can’t or won’t listen to each other, in order to solve even the simpler problems. Hatred???? Really??? More like hyperbole on your part, Tyler. Maybe you would have preferred it if the rec comm had just raised rates and said nothing about it. Now that would have been tacky behavior. People…get a life…most of the comments here are sophomoric. We’re talking about beach passes not the Ct. State economy. It’s a free country if you don’t like it go somewhere else. There are many, many choices. Use them. Sherwood Island will be FREE!!! Not shopping or dining in Westport is childish. But then what do I know. Just 80 and laughing at what folks today think is IMPORTANT. Just ladt week we personally experienced the Hawaii missle alert. That was IMPORTANT. — as Alaska and BC experienced a real earthquake tsunami alert. Very important, as you say. Despite thinking all the fuss is silly you still took the time to read everything and post. Just because an issue doesn’t rise to level of impending missle attack doesn’t mean people shouldn’t care. If you roll over on everything and deem non disastrous things too small to care then soon you will find your choices greatly limited. It might seem small but many people of Weston have been good and loyal patrons of Compo Beach and Westport for years. The reasons for this increase do not add up and that is a big reason for the uproar. Legitimate questions regarding the financing and revenue intake of Compo have been raised and there haven’t been any good answer. The attitude of if you don’t like it go somewhere else isn’t exactly a satisfactory answer. All generations have voiced displeasure at issues large and small. Your generation is no different. But you and every other person on this discussion opposed to the price being raised disproportionately is just whining. And there’s is no need for adequate answer than “that’s what we decided” because the people deciding don’t answer to you (or me). I wish I didn’t have to pay nearly $800 for my pass but I will. Congratulations on your recent vote to raise the cost of parking passes at Compo Beach. It will without doubt solve your crowded parking lot issues. As a Weston CT resident for the last decade, I have been a patron of more Westport CT businesses than I can account for. They are the large ones, like your grocery stores. They are the very small, individual ones, like local artists. They are everything in-between. My family and I have given our support and participation to programs at your schools, summer camps, continuing education, performing art venues, libraries, Arts Center, Historical Society, places of worship, places of hardship, and yes, even at Compo Beach. Year after year, we have frequented downtown events, such as art festivals, mini makers fairs, First Nights, cultural projects, community fundraising events, animal rescue, Levitt Pavilion, Project Return, etc, etc.….and have never walked by a Westport Boy Scout selling popcorn, or a Westport Girl Scout selling cookies without buying a box…we’ve always given Westport special consideration, above other neighboring towns, because, after all, Westport is our sister-town, right? That all that ended today. Upon my reading this blog entry https://06880danwoog.com/…/coming-this-summer-higher…/, and the comments that followed, I realize that Westport certainly doesn’t see Weston in that same familiar way. The tone of your Parks and Rec Commission Chair in his comment “addressed to Westonites” is patronizing at best: “We hope you continue to use our fine facilities in Parks and rec, but it’s a free world.” So it is a free world; and my family will choose to no longer give special consideration to Westport, starting with the Compo Beach parking passes, though certainly not ending there. Our choices for recreation, shopping, services, as well as deserving causes in Fairfield County are boundless. Dear Ms. Field — I lived in Westport for 18 years and my husband for over 30 years when we moved 1/2 mile over the Fairfield line in 2001 because we couldn’t find a smaller house in Westport in which to downsize. We were very active in Westport, supporting and participating in just about everything you mentioned, plus a few others. I served two terms on the Westport ZBA and one term on the BAA. My husband use his graphic expertise to produce Newsletters and Bulletins for several Westport organizations (pro bono). As a filmmaker, he produced several films for non-profits, nd still does. We paid our taxes, happy to live ins such a vibrant community. After moving to Fairfield, we have continued to volunteer for several Westport organizations, and happily do so. We also patronize Westport businesses and restaurants regularly. Does this entitle us to a discount on Compo beach passes? NO! And we have never asked for them, although I’d be happy to pay the Weston rate. If we want to go to Compo, we have to pay the daily fee, get a ride with a Westport resident, or attend the occasional Church activity that allows non-residents in without having to pay. Ms. Field, stay away, if you wish. It’s a free world! But I think you’ll miss Westport more than Westport will miss you. If you think I’m dumping on Westport because of the beach sticker prices, then you misread my letter. My upset came from the mean-spirited, ugly tone that some Westporters have hit aimed specifically against Westonites, including the sarcasm P&Z Commissioner Chair allowed himself. In his role as that, Mr. Haberstroh speaks for the Town of Westport, and so I responded to the Town of Westport. In exchange for the few dollars off a beach sticker, which has been grandfathered into the fabric of the Westport-Weston tradition, Westonites, for generations have supported Westport in ways that go far beyond shopping and dining. As for your last line, please, that’s precisely the unnecessary mean tone I’m referring to. Westport has much bigger things missing than little old me…like warmth and kindness and a welcoming spirit. I have lived in Westport for 53 years and for the life of me have no idea why Weston gets any special treatment as opposed to Easton, Redding, or any other landlocked town. Is there some birthright here that I missed. As Mr. Stein opined above it just sounds like “whining to me.” Move on. Yes, I agree Westonites are whiners, not worthy of the elite status that Westport residents deserve. For one thing, there is no Maserati dealership there, for Chrissakes! Only a handful of homes sell for over $2 million. No hedge funds have their offices there, even! Last but not least, there is no $140,000 BMW i8 electric sportscar in the high school STUDENT parking lot. Seriously, Westport folks don’t have to worry: we Westonites are not SO middle class that raising the price of a beach sticker $125 will make a big difference. All it does is show that today’s Westport movers and shakers are a**holes. So amazing! I’ve just read all 130 comments and am reminded that the squabbles about Compo Beach go back more than 100 years. I cannot imagine what the beach would have become had it remained private property. Would it have become some .0001% homeowner’s secluded playground? Or perhaps a commercial site with a big Boardwalk like Coney Island? Or filled in and covered with little beach cottages? Maybe even a modern “Bradley Beach”? Instead, like Longshore, it became a valuable and much loved recreation area for Westport… with the problems you see today. By the end of the 1880s my 3x-great grandfather David Bradley owned and farmed most of the land south of South Compo Road extending from the Minute Man to the corner at Soundview, including Gray’s Creek to the mouth of the Saugatuck River, Cedar Island, Finches Island, Heron Island, Owenoke, the Bradley Street area and the beach. He farmed onions and sent them to the markets in NYC. The farmhouse still stands at the corner of Apple Tree Trail and Compo Beach Road. Finally, in 1901-1903 the Town of Westport took David to CT Superior Court where he lost the beach to the town – for a compensation of about $1,500, I believe. Without that event, who knows what everyone would be arguing about today? Great story, great history, thanks! The parking problem which is really what underlies all of the discord and the fee increase could be so easily addressed by building a 50 story parking garage camouflaged as a practice field for rock climbers modeled on Devil’s Tower. Then we could all live in harmony and rappel without being rapelsive. Mountain climbers deserve to enjoy Compo too. No, build a Real mountain. That way, you can have Swiss-like parking and military within, plus an endless water supply without. Voila! Prosit! Yay. Great idea. It’s about time. The past several years I went to Compo I was annoyed that I wasn’t meeting anyone from my community like I did in the 70’s and 80’s. Lots of strangers from far and wide. The additional littering and lack of parking spaces only added to my annoyance. I’m glad this is being done. Thanks for the heads up about State Parks too.